I have spent 20 years designing beautiful and functional custom closets for people. It never fails that when closing a sale many clients will ask me "do you come and put our clothes away too?" Of course I will if they want me to, but for those who prefer to do it on their own, I share my 5 Tips for Easy Closet Management. These tips will not only help you maintain an organized closet (whether custom designed or not) but they will help you keep track of, and make the most of your wardrobe! It is so easy to forget what we own and then spend money on items we don't really need! 1- Put out of season clothes away: Away can mean in a bin under your bed, on the top shelf, in an extra closet or even just towards the back of the closet you are using. The purpose of this is to keep what you are currently wearing more visible. 2- Keep "Like with Like": This goes for items (ie: shirts and pants) and colors. You want to keep the same colors together so that you can see what you own and avoid buying duplicates. How many of us have at least one too many plain black t-shirts. By keeping "like" items together you can create new and different outfits with the clothing you have. If you hang things as "outfits" they tend to be worn the same way, with the same pieces all the time. That is not using your wardrobe to it's full potential. 3- Keep items that can be nicely folded on shelves: First of all, folding anything that is knit will avoid stretching the garment and prevent hanger marks in the shoulders. I hate it when I look in the mirror and I have these 2 little bumps on my shoulders and I have to throw that piece in the wash again to re-set it. Second, what you don't see you won't wear. This is fact. No one has the time to go searching for a piece of clothing when they are rushing to get dressed in the morning!. 4- Contain things that can't be nicely folded in drawers or baskets: Drawers are for dumping! That is not to say that a drawer can't be nicely organized - it can. 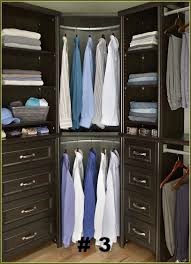 Drawers should hold underwear, socks, P.J's, bathing suits, workout clothes etc. What you don't want happening in drawers are piles where you wear the first piece, wash it, put it away on top and continue that cycle, thereby not wearing any of the pieces underneath. 5- Once you have worn something turn the hanger backwards in your closet: I am not sure who first came up with this idea but now it is seen all over social media. I am adding it here because I am a big fan! This is a simple way to keep track of what you are actually wearing and at the end of a season you will know what should be given away! If you are not wearing it....someone else will! I hope that you will at least TRY to implement these tips into your closet organization. Let me know how it goes...I love a good success story!